Using Mailshell's SDK Lite, less than 1MB of code resides on the device. 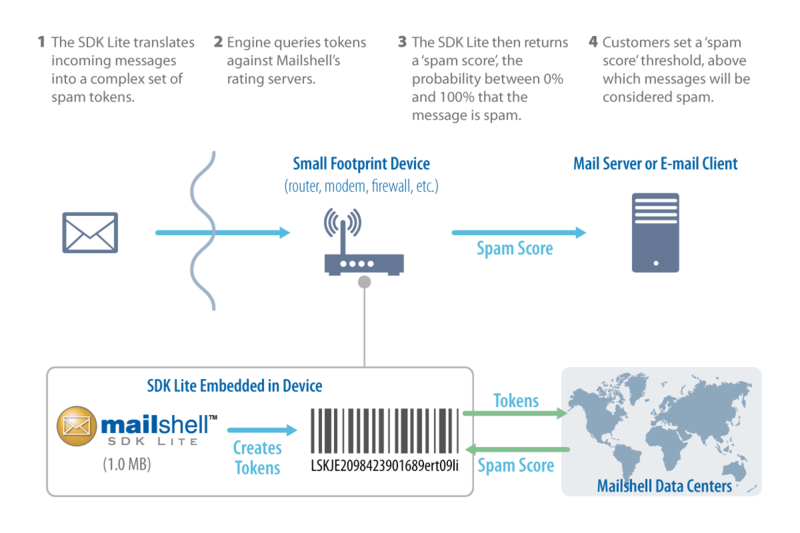 The SDK Lite creates fingerprints of each incoming message and compares them to fingerprints in Mailshell's databases. For each message, Mailshell returns a "spam score", i.e. the probability between 0%-100% that the message is spam. If the score exceeds a specified value, as chosen either by the OEM or by the end-user, the message can be reliably flagged as spam. Support for connecting IP and message token reputation evaluation by LiveFeed. More than 60 data centers throughout the world ensures high availability and low latency. Returns a phish probability flag. Accept requests over both TCP and UDP to port 80. Available on both MIPS and ARM-based 32-bit and 64-bit Hardware Platform. Available on Linux and uClinux OS.